If you are looking for a healthy knockoff version of the popular Chinese fast food, Sweet and Sour Chicken, well you came to the right blog today! This Baked Sweet and Sour Chicken has just 2.5g of fat and a total of 8 Points per serving which is a lot less than the kind you’d buy at a Chinese restaurant. But the taste is fantastic, and it truly tastes just as good as the full fat version. It’s really easy to make and doesn’t require a lot of ingredients, so it’s a great idea for a delicious Weight Watchers dinner recipe if you need a meal in a pinch. I love love LOVE sweet and sour chicken, so I was very hesitant to believe that a baked version would taste just as good, but I was very pleasantly surprised…it truly was DELICIOUS! If you love Chinese fast food recipes, this one is an absolute must try. Enjoy! The rice you see in the photo is my Chicken Fried Rice recipe which is only 4 points +. 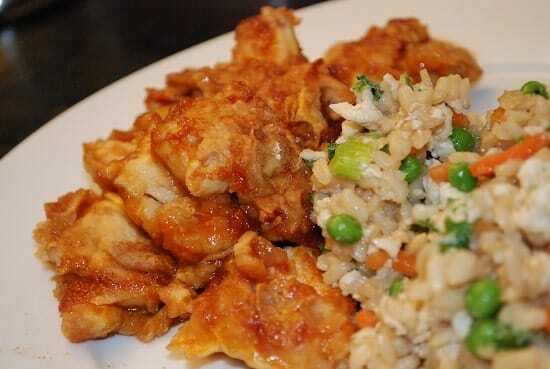 This amazingly delicious Baked Sweet and Sour Chicken Recipe tastes just like the kind that you’d get at your favorite Chinese fast food restaurant, but this light sweet and sour chicken has just 2.5g fat and 8 Points per serving. Season with salt and pepper to taste. Dip chicken into the cornstarch to coat then dip into the liquid egg substitute. Spray a large skillet with non-fat cooking spray and set over medium high heat. Cook chicken until browned but not cooked through. Spray 9×13 baking dish with the non-fat cooking spray and place the chicken in it. Mix the remaining ingredients in a bowl with a whisk and then pour evenly over the chicken. Bake for one hour and turn the chicken every 15-20 minutes. OMG, This recipe was everything. The chicken was moist but firm and I served it with Trader Joe’s cauliflower fried rice and of course lots of soy sauce. Thanks for sharing. I have made this twice and it is absolutely delicious. I passed the recipe on to a few people and everyone LOVED it. This turned out really good! Though we had to double the ‘sauce’ recipe to pour over the chicken with 5 minutes left to bake because it seemed too dry. Maybe that was because we had slightly over one pound of chicken? This added a few more WW+ points per serving. Regardless, it turned out pretty good and easy to make. We steamed up some brown rice and broccoli for a satisfying and healthy 13-14 WW+ point dish altogether. One more thing: Step 2 above was worded strangely, so the chicken was submerged in egg white before the corn starch and seemed to work..
Any chance I can use apple cider vinegar instead of whirw vinegar? Yes, it shouldn’t make much of a difference. Anybody know if this is 8 points for JUST the chicken or if it’s 8 points for the chicken and the rice together? Or would it be 12 points with the chicken and the rice? Thanks! we loved this!! made the fried rice with it… so yummy!! thanks!! If I use egg whites instead of egg substitute, will it change the points? No, since the liquid egg substitute is almost the same in nutritional information. I didn’t care too much for the texture but the flavor was pretty awesome. My hubby (who is VERY picky) really enjoyed this dish!